When: 2nd Sunday of month at 6.30pm except where it falls on yom toivim. Where: Newtown Synagogue Hall (&lstrong>t;NSH), 20 Georgina Street, Newtown or at Inner West Chavurah (IWC) private residence. IWC no cost but bring a plate & drink when at IWC venue. Committee: NS Liaison: John Cruthers. IWC Liaison: Alan Rosen,Sheree Waks. Procuring and synopses of films: International – William Szekely, Australian – Rod Freedman. 107 mins (1983). Director: Alan Johnson; Producer: Mel Brooks; starring Mel Brooks, Anne Bancroft, Tim Matheson, Charles Durning, Christopher Lloyd, José Ferrer. Synopsis: This remake was one of the first major American films to acknowledge that homosexuals were persecutedby the Third Reich, along with other Holocaust victims. This version was extremely faithful to the 1942 film on which it was based, and in many cases dialogue was taken verbatim from the earlier film. The character of the treacherous Professor Siletski, played by Jose Ferrer, was however made into more of a comic figure, and even into somewhat of a buffoon, whereas in the original he was the one completely serious character in the film. For his humorous performance as Colonel Erhardt, Charles Durning was nominated for the Best Supporting Actor Academy Award. Is this film just a satire on the Nazis? How does it compare with The Great Dictator? Is this film really serious? Is it a survival fantasy? Who is allowed to make fun of the Holocaust? What comparisons can be drawn with The Producers, Train de Vie, Life is Beautiful etc. WRONG SIDE OF THE BUS56 mins (2009). Produced by Rod Freedman and Lesley Seebold. Directed and written by Rod Freedman. Synopsis: Sid Bloch, Professor of Psychiatry from Melbourne, returns to Cape Town for his medical school reunion. Sid has suffered from a troubled conscience for forty years and wants to resolve his guilt for colluding with Apartheid – but what will it take to free him from his past? He is accompanied on his quest for reconciliation by his son, Aaron, who is also his harshest critic. Narrated by Aaron, the film explores how a good person accepts racism and injustice. Screened in festivals in Australia, Israel, South Africa, Canada and USA including New York, Washington, Seattle, Atlanta, San Diego and others. Awarded ‘Best African Documentary’ International Film Festival South Africa. Discussion led by Rod Freedman. 40 mins (2010). Produced and directed by Karen Goodman and Kirk Simon. Academy Award 2011 for Best Documentary Short Subject. Synopsis: In the heart of Tel Aviv, there is an exceptional school where children from forty-eight different countries and diverse backgrounds come together to learn. Many of the students arrive at Bialik-Rogozin School fleeing poverty, political adversity and even genocide. Here, no child is a stranger. Strangers No More follows several students’ struggles to adjust to life in a new land while slowly opening up to share their stories of hardship and tragedy. With tremendous effort and dedication, the school provides the support these children need to recover from their past. Together, the bond between teacher and student, and amongst the students themselves, enables them to create new lives in this exceptional community. Discussion led by Rod & Lesley Freedman. Discussion led by Offer Israeli (who was in the 1982 campaign) and Vered Rodriguez, a young Israeli filmmaker and animator. 55 mins (2010). Written, produced and directed by Mark Radomsky.Synopsis: This film documents the 2009 football tour of Australia by an Israeli-Palestinian combined Youth Peace AFL football team coached by Australians (they will be coming again in September 2011). In an attempt to sideline decades of conflict, a joint team of Israeli and Palestinian sportsmen learn Australian Rules football together. They hope to play on the same side against 16 other countries, in the AFL International Cup. Hardly any of the aspirant players had ever heard of the game previously, and none ever imagined befriending teammates across the political/ cultural divide. But with open hostilities raging around them, will these old enemies set aside prejudice and hostility to unite into a single Peace Team? Discussion led by Mark Radomsky and the organizer, Tania Oziel. &nbsp;Until When?Set during the current Intifada, this documentary follows four Palestinian families living in Dheisheh Refugee Camp near Bethlehem. Fadi is 13 and cares for his four younger brothers. The Hammashes are a close-knit family who pass on the lessons of life with humor and passion, Sana is a single woman who endures long commutes to do community work, and Emad and Hanan are a young couple trying to shield their daughter from the harsh realities of the occupation. They talk about their past and discuss the future with humor, sorrow, frustration and hope. Until When paints an intimate in-depth portrait of Palestinian lives today. Newtown Synagogue is excited to present the film “Children of the Sun”,Sunday 11 December at 6:30pm @ 18 Georgina St Newtown. Light refreshments will be served and film will be introduced by Offer Israeli who will provide some personal reflections on growing up on a Kibbutz. 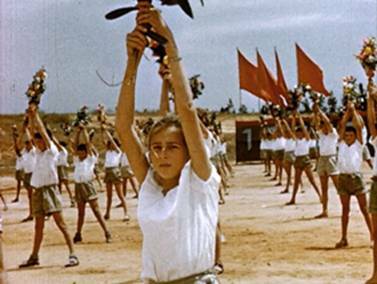 Synopsis: Children of the first kibbutzim in Israel were born in the early 20 th century to youthful parents, full of hope. They have been called “Children of the Sun”, because they considered them children of the “Sun of Nations” Revolution in Israel. They were born into a eutopia and were destined to become the “New Man”. They were educated in a ideological society that aspired to replace the traditional family with the collective one, to subjugate the will of the individual in favor of the common good and a life of equality. “Children of the Sun” tells the story of the journey in search of a society’s memory and the concepts that have passed from the world. The film is a collage comprised of over eighty amateur films. The tapestry of rare materials from which the film is compiled creates both a very personal and very public story, a form of super story about one of the most fascinating myths of the Zionist movement in the Land of Israel. Best Canadian Film of the Year. 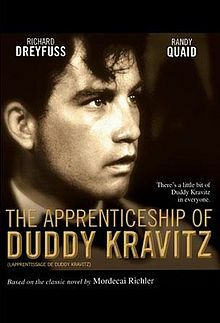 The younger son of a working-class Jewish family in Montreal, Duddy Kravitz yearns to make a name for himself in society. This film chronicles his short and dubious rise to power, as well as his changing relationships with family and friends. Along the way the film explores the themes of anti-semitism and the responsibilities which come with adulthood. The film is based on Mordechai Richler’s novel of the same name. Another adaption of a Richter novel, “Barney’s Version”, has recently screened in Australia. Director Ted Kotcheff directed the Australian classic “Wake in Fright”. At the time of its release, it was the highest grossing Canadian film ever made, and was described as “a coming of age” for Canadian cinema. As usual, please bring some food/drink to share for supper. If no parking on Louisa Rd, try Grove St next to Birchgrove Oval. It is 1942, the war is in full swing and France is occupied by the Nazis. To Robert Klein, however, these events are of little concern. As an art dealer, he makes a nice profit off the situation of the Jews, who are selling their possessions in a hurry to leave the country. He holds no political affinities and chooses to remain indifferent. All this changes when one day, a Jewish newspaper is accidentally delivered to his address, and Klein discovers there is another Robert Klein residing in Paris, a Jew sought by the police. When the other Klein cannot be found, authorities grow suspicious and the art dealer is forced to offer proof of his French heritage. Before long he is entangled in a quest to track down his elusive namesake and find out what happened. 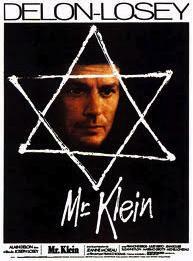 Eventually, Klein fails to prove his identity and becomes a victim of the Vel’ d’Hiv Roundup, reunited with Jews who once were his clients.$5 members, $10 non-members. Light supper provided. Enquiries: John Cruthers 0433 020 237. All welcome. The Inner West Chavurah and Newtown Shul continue our series of film and discussion nights. For 5 years during WWII, Warsaw women outfoxed the Nazis to save thousands of Jewish children from certain death. 95 year old Irena Sendler reveals their story in this film which premiered in March 2011. Synopsis: In 1905 a 19-year-old Russian girl suffering from severe hysteria is admitted into a psychiatric hospital in Zurich. A young doctor, Carl Jung, takes her under his care and for the first time experiments with the psychoanalytical method of his teacher, Sigmund Freud. Based on recently exposed secret correspondence between Jung, Freud and Sabina Spielrein, this film begins with Spielrein’s healing, closely related to her passionate love affair with Jung, followed by her return to post-revolutionary Russia, where she became a psychoanalyst herself, founding the famous White School, and her sudden death in 1942, the victim of Nazi violence. The investigation of this story becomes an essential component of the film via two modern researchers who follow Sabina’s life from Zurich to Moscow to Rostow, leading to the discovery of missing portions of the original correspondence. Seduced by Jung, killed by hate, redeemed by history. In 1905 a 19-year-old Russian girl suffering from severe hysteria is admitted into a psychiatric hospital in Zurich. A young doctor, Carl Gustav Jung, takes her under his care and for the first time experiments with the psychoanalytical method of his teacher, Sigmund Freud. Based on recently exposed secret correspondence between Jung, Freud and Sabina Spielrein, this true story begins with the Spielrein’s healing, closely related to her passionate love affair with Jung, followed by her return to post-revolutionary Russia ? where she became a psychoanalyst herself founding the famous White School ? and her sudden death in 1942, the victim of Nazi violence. The investigation of this story becomes an essential component of the film via two modern researchers, Marie, a young French scholar, and Fraser, a historian from Glasgow, who follow Sabina’s life from Zurich to Moscow to Rostow, leading to the discovery of missing portions of the original correspondence. And since any exploration of others’ lives inevitably leads to delving into one’s own self, the two stories then finally interweave and are swept away in the passionate journey. Written by Harmony Gold USA, Inc. The evening will start with a reading from the book of Lamentations which is traditionally read in all Synagogues throughout the world on this day followed by the movie. RSVP: Sheree – 9555 7738 / 0419 247 265 The Tunisian-French Laura (Fanny Valette) is a young woman who lives with her Orthodox Jewish family in the Jewish community in the suburbs of Paris. Her mother is a widow from Tunisia; her sister Mathilde (Elsa Zylberstein) is having troubles in her marriage because she repressed her sexual desire based on her misunderstandings of the principles of her religion. Laura is an open minded student of philosophy and works cleaning a school on nightshift. While Laura feels a strong passion and desire for her Muslim Algerian colleague, her sister finds out that her husband had an affair with a woman and looks for an adviser to help her interpret the true meaning of love and the duties of a married woman. “La Petite Jerusalem” is a sensitive film about religion, intolerance, philosophy and repressed desire, written and directed by Karin Albou. It is in French, Ara- bic and Hebrew, and has won a number of awards at European film festivals. The Inner West Chavurah and Newtown Synagogue continues our stimulating series of films and discussion. Directed by Elisabeth Scharang. With Johannes Krisch, Orsolya Tóth, Ursula Strauss. Featured at the 31st San Francisco Jewish Film Festival 2011. Time: 6.30pm Date: Sunday, 2 December. Location: 136 Louisa Rd Birchgrove, upstairs. Please bring food/drink to share for supper (non-Kosher is fine). Film synopsis: Aaron, a respected butcher and a family man in an Ultra-Orthodox Jewish neighborhood in Jerusalem, leads a conservative life of community devotion and spiritual dedication. Aaron’s life undergoes a series of emotional changes following the arrival of a young apprentice to his shop. Consumed with lust, the handsome “Yeshiva” student irreversibly transforms the intricate beliefs in the once-devoted butcher’s life – leading Aaron to question his relationships with his wife, children, community, and God. Winner of numerous awards at film festivals around the world. Director: Haim Tabakman Writer: Merav Doster (screenplay) Stars: Zohar Shtrauss, Ran Danker and Tinkerbell. Directed by Alejandro Springall. With Blanca Guerra, Martha Roth, and Sergio Kleiner. The Inner West Chavurah and Newtown Synagogue continue our series of films and discussion. Discussion to follow film screening. the next screening in Spool and Spiel series will be “Prisoner of her Past” at 6.30pm on Sunday 14 April at 136 Louisa Rd Birchgrove, upstairs.Please bring food/drink to share for supper. Prisoner of Her Past is a 2010 documentary film, produced by Kartemquin Films, that follows the journey ofChicago Tribune music critic Howard Reich as he travels to Europe to discover why his elderly mother, Sonia Reich, believes people are trying to kill her. Inspired by conversations with young trauma survivors in post-Katrina New Orleans, Howard Reich begins to discover a secret that his mother, Sonia, had kept hidden for over 60 years. For most of her adult life, Sonia Reich was a well adjusted and self-sufficient woman, but now in her eighties, Sonia is suffering from late-onset Post Traumatic Stress Disorder. In order to understand his mother’s past, Howard Reich travels to Eastern Europe to discover that Sonia spent her adolescence fleeing the Nazis during World War II. Meeting some of Sonia’s distant relatives and childhood friends, Howard begins to unravel what his mother has always refused to speak about. Having lost most her family to the Holocaust, Sonia spent five years as a “jungle child”, starving and constantly on the run. Now as Sonia tries to forget her past, Howard attempts to ease her pain and confront the horrors that haunt her. BLINKY & ME (75mins) follows the artist and his family through his childhood in Nazi occupied Poland, in Israel, and all the way to Australia, where he made many animated films for children, including the popular film series ‘Blinky Bill’. Monday Night is the onset of the 9th of AV. The day that both Temples in Jerusalem were destroyed and a tragic day on the Jewish calendar. We refrain from eating and drinking for 24 hours as well as not wearing leather shoes.We will be hosting a reading of the book of Lamentations followed by a movie in the Hall. Start time 7:15 pm reading of Lamentations – 7:30 pm Movie. Based upon the final confession of Adolf Eichmann, made before his execution in Israel as he accounts to Captain Avner Less, a young Israeli Police Officer, of his past as the architect of Hitler’s plan for the final solution. Captured by intelligence operatives in Argentina, 15 years after World War II, Eichmann (Kretschmann), the World’s most wanted man, must be broken down and the truth unveiled. As the world waits, two men must confront each other in a battle of wills- the result of which will change a nation forever.